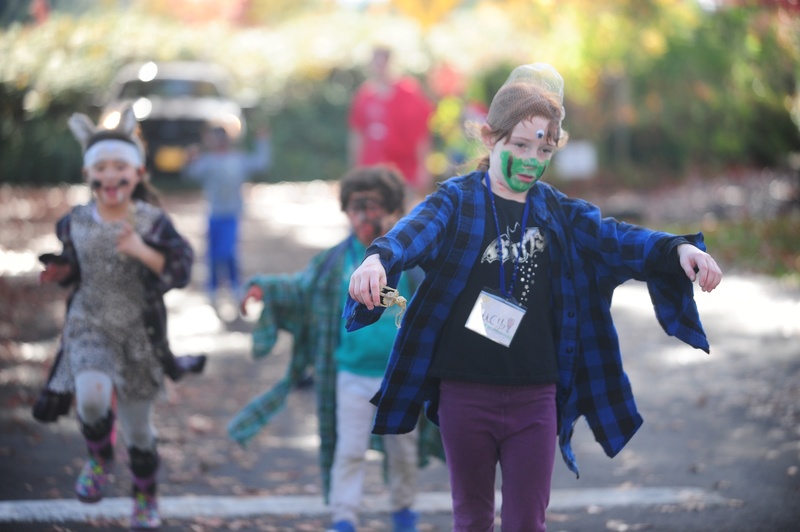 Zombies in the garden–just one of the ways kids can burn off that extra energy in Lake Oswego waiting for Halloween to arrive. Got little kids ready to burn off some nervous energy waiting for Halloween to arrive? Lake Oswego has you covered. Here are some activities to channel all that adrenaline. VISIT THE SCARECROWS. Checking out the Luscher Farm scarecrows is worth making an annual tradition. From frumpy to spooky to friendly, they come in all shapes and sizes thanks to the inspiration of volunteers who deck them out each year. See if you can find Sneaky Peet hiding out! Scarecrows are up through Halloween. 125 Rosemont Road, 503.534.5284. GET CRAFTY: NEEDLE FELTED MONSTERS. Felt crafting is a user-friendly way of getting creative and needle felted monsters seem to be all the rage. Just google them and you’ll find more Pinterest boards devoted to the subject than you have time to look at. The library is hosting an hour craft session for tweens and teens on Thursday, October 4 from 4:00 p.m. to 5:00 p.m. 706 Fourth Street, 503.679.2579. PUMPKIN CARVING CONTEST. It’s the battle of the jack-o-lanterns. See if you teen can win! Friday, October 20 from 5:00 p.m. to 7:00 p.m. at the Lake Oswego Teen Lounge, 1500 Greentree Road, Open to ages 11-17. 503. 675.2549. SCULLY THE SCARECROW WELCOMES THE FALL. Penny’s Puppet Productions invites little ones to get to know Scully and some of his newfound farm friends including Punky the Pumpkin and Creeks the black cat. Saturday, October 21 from 10:30 a.m. to 11:45 a.m. at the Lake Oswego Public Library, 706 Fourth Street. 503.697.6580. PAINT YOUR OWN PUMPKIN. Who says a pumpkin can’t be pink? Let them get creative without making a mess at your place! Bring your own pumpkin or choose from ones provided. Friday, October 27 from 1:00 p.m. to 3:00 p.m. at the Lake Oswego Public Library, 706 Fourth Street. 503.697.6580. SCARY MOVIE NIGHT. If shrieking out with friends sounds like your teen’s MO, steer him or her in the direction of the LO Teen Lounge for Scary Movie Night. Open to ages 11-17. Friday, October 27 from 5:00 p.m. to 7:00 p.m. 1500 Greentree Road, 503.675.2549. PAL-O-WEEN. Enjoy safe, family-friendly activities while kids go trick-or-treating in costume. Tuesday, October 31 from 3:00 p.m. to 6:00 p.m. for ages 0-12. Free. Lake Oswego Parks and Recreation at Palisades, 1500 Greentree Road, 503.675.2549. Looking for other ideas? Check out some of my earlier posts on Halloween activities in Lake Oswego. Don’t let venturing into the real estate market spook you. Give me a call at 503.939.9801 or check out my website and let me put my 25+ years of experience as a Realtor in Lake Oswego to work helping you make your next move. This entry was posted in Holidays in Lake Oswego, Things to Do in Lake Oswego and tagged Halloween, Halloween activities in Lake Oswego Oregon, Lake Oswego Oregon. Bookmark the permalink.